Sounds Like: Beatles, Temples, Klaatu, Bonobo, Tame Impala. Sign up for Broadjam today to follow Applefuzz, and be notified when they upload new stuff or update their news! Stinging VOX fuzz guitar lead for this Psychedelic song. This heavy driving song fits right in for a horror-mystery soundtrack. 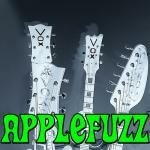 Sounds like it could be from a 60's movie called "The mind snatchers"
Would you like to help Applefuzz get heard by industry pros by buying them a song submission credit to Broadjam Music Licensing Opportunities?